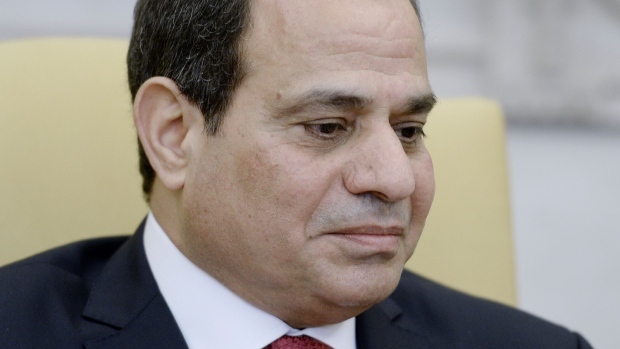 (Bloomberg) -- Egypt’s parliament on Tuesday overwhelmingly approved a constitutional amendment that would allow President Abdel Fattah El-Sisi to remain in office through 2030, a decision widely seen as inevitable from the day it was floated. The change, which amends the presidential term to six years from the current four, must also be ratified through a national referendum. That step, too, is expected to easily pass in a country where the crackdown on Islamists has widened to include critics of El-Sisi’s regime. The article is retroactive and effective immediately, Parliament Speaker Ali Abdel-Aal told lawmakers, according to the state-run Middle East News Agency. Even before Tuesday’s vote, roadside billboards and posters, and half-page ads in state-run daily newspapers, had been exhorting voters to carry out their national duty and vote in the referendum. The extension of El-Sisi’s potential tenure by eight more years has upset rights groups, activists and other critics who contend that Egypt has become even more intolerant under the former general than it was under ousted President Hosni Mubarak. Lawmaker Mohamed Anwar El Sadat, the head of the Reform and Development Party, urged Egyptians to vote “no” in the referendum. “We again echo our disagreements with such attempts that are considered a counterclockwise attempt and a return to the pre-Jan 25th revolution,” El Sadat said in a statement. “Since the legislative authority and the state institutions do not grasp the dangers of violating the constitution and tailoring specific articles to fit only the president,” Egyptians must turn out and vote against it, he said. The president’s backers say he’s the only one able to carry out the expansive economic program that’s managed to revive an economy that stalled after the 2011 uprising against Mubarak. On a near-weekly basis, El-Sisi appears at conferences or events, grilling speakers about specific projects, timelines and costs. His hands-on style and command of details have resonated with many Egyptians, and stand in stark contrast to Mubarak, who was seen as largely out of touch with the nation, and his successor, Mohamed Mursi, who was viewed as a puppet of the Muslim Brotherhood group. The amendments would also deepen the military’s role in the country by making it responsible for safeguarding the constitution, people’s rights and civilian rule. Detractors have warned about further empowering an institution whose authority has grown significantly since El-Sisi’s initial election in 2014. They would also tighten El-Sisi’s grip on the judiciary by giving him the final say over judicial appointments and the naming of the country’s top prosecutor.